In 1985, when architectural journalist Patricia McHugh released the first edition of her encyclopedic Toronto Architecture: A City Guide, the old industrial and residential neighbourhoods near the downtown core were still in decline, and, although the city was experiencing a growth spurt, it was nothing like the ultra-intensive infill and Manhattanization of the city that residents have seen in recent years. Today many old downtown factories and loft buildings have been renovated and repurposed into condo buildings, offices and studios, and thousands of people have returned to the inner city, which is booming as never before. With all this sweeping change, McHugh’s book needed renovating as badly as any of the old warehouses on Spadina, Adelaide, Wellington or Richmond. A native of Los Angeles, McHugh lived in New York and London before settling in Toronto in 1972, tracing a similar path to that of famed urban writer and activist Jane Jacobs, who arrived in 1968. McHugh “shared Jacobs’s love for a walkable and diverse cityscape,” notes Globe and Mail architectural writer Alex Bozikovic who has splendidly revised and updated her original opus. Like a good architect, Bozikovic respected the bones of the original, expanding it outwardly with sensitivity and seamless perfection to deliver the same high level of insight and concision we had come to expect from McHugh, who died in 2008. The book offers a Toronto-centric architectural style guide as well as a glossary, list of suggest reading, and extensive indexes of architects and buildings. At 294 pages, my well-thumbed second edition (1989) featured images of “new” City Hall and the CN Tower on its cover as emblems of modernism. 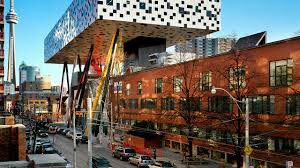 The new edition (338 pages) replaces these with a striking, colourful close-up shot of the checkered underside of OCAD’s fabulous stilted building on McCaul Street, a bold “flying box 88 feet off the ground that became an “instant showpiece” when it opened in 2004. For dozens of major buildings, the authors recount a site’s vanished history while astutely assessing its present configuration, often tiptoeing into tomorrow. We learn, for example, that King Street’s artful TIFF Bell Lightbox occupies the site of Toronto’s first general hospital (1829 to 1862). Just down the street, Bozikovic lavishes enormous praise for a future development that cannot yet be seen: David Mirvish’s very tall, twin proposed residential towers atop a base of shopping, university campus, and an art gallery to house Mirvish’s own world-class art collection, breathtakingly designed by Gehry. Books such as Eric Arthur’s Lost Toronto have described the wealth of stunning local architecture that has disappeared, so it’s consoling, if not downright remarkable, to recognize the innumerable architectural treasures and noble failures that still grace our streets. Reading Toronto Architecture: A City Guidemakes one want to cast a new eye on buildings we’ve often passed by without having really observed them. Or better yet, to attempt some of the walking tours with guide in hand. Because Toronto is a city with one of the largest Jewish populations in the Diaspora, references to Jewish architects and sites of Jewish interest are liberally interspersed thoughout this book. Benjamin Brown is one of several notable Jewish architects whose garment-district buildings in the Spadina corridor are spotlighted; the former Standard Yiddish Theatre at Spadina and Dundas, which Brown co-designed with J. M. Jeffrey, also merits treatment, in this case more for its historic past rather than its ignoble present. Several synagogues are highlighted, including Holy Blossom (past and present), Kiever, Beth David, and Beth Tzedec (but the Junction shul is notably absent). There’s even a discussion of St. John’s Ward, landing ground for multitudes of Jews and other immigrants in the last century. The book credits Nathan Phillips, Toronto’s first Jewish mayor, for bringing Toronto into the modern era by commissioning the new City Hall, but doesn’t mention his over-zealousness for urban renewal, which brought down far too many landmarks of the Ward.